Finding the right kitchen accents that easily transition between seasons can be tough, but we’ve sourced several that do the job in style. White works just as well for winter as it does for warmer temperatures. 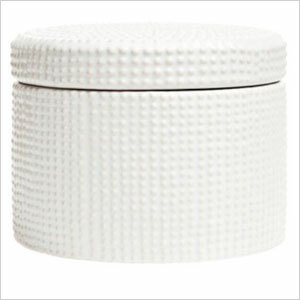 Stack a few of these ceramic jars on the counter to house anything from spices to paperclips to receipts (H&M, $13). 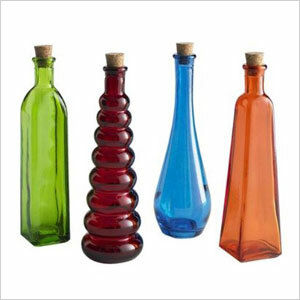 No matter what you house in these colorful hand-painted glass bottles — from vinegar to simple syrup — they’re sure to make a statement on your countertop no matter the season (Pier 1, $14). 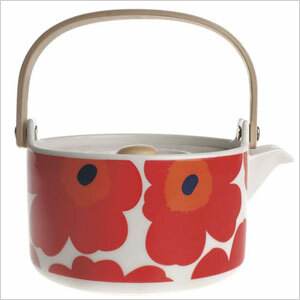 The bold blooms on this Marimekko teapot can either add a pop of color to your kitchen on drab winter days or usher in a new season, depending on when you have it on display (Crate & Barrel, $98). 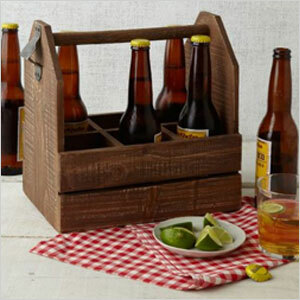 We love that you can use this rugged wooden beer caddy in the winter to transport your favorite brews, but then in the spring and summer, use it to hold condiments during dinner parties (West Elm, $49). We love these tea towels for all seasons, but especially for transitioning from winter to spring. 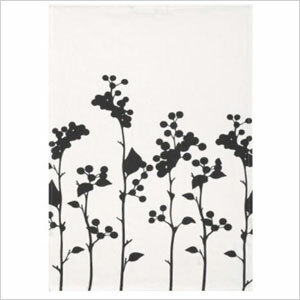 The organic cotton towels are printed with what could either be early spring or late fall blooms, which works for cold or warmer weather (H&M, $5). 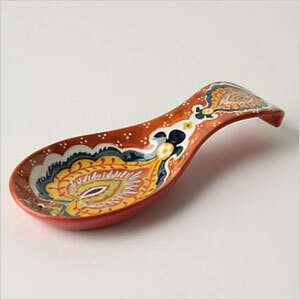 A spoon rest might feel like a utilitarian kitchen accent, but it doesn’t have to be. Choose something colorful and give it a prime spot on your counter. The bold pattern works for both winter and spring (Anthropologie, $10). 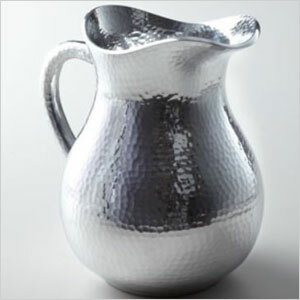 This shimmery hammered pitcher has a timeless quality that makes it an ideal kitchen accent for any season. 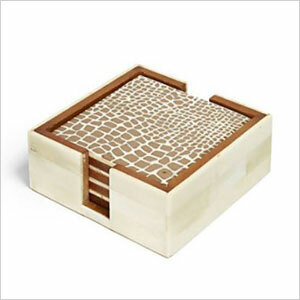 Use it when guests are over, but leave it on display when they’re not (Horchow, $62). Gold is a classic hue that looks great no matter what season you’re using it. 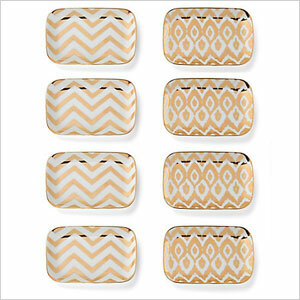 Serve your famous crab cakes or mini meatballs on these elegant mini appetizer plates that look great even when they’re not in use (C Wonder, $48 for a set of eight). The best way to transition your home from winter to spring is to add a few bright hues. 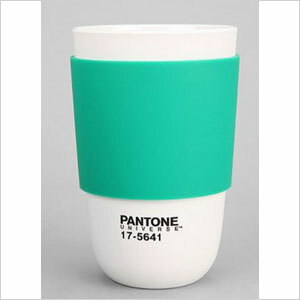 We love these adorable cups featuring colors classified by Pantone. Choose from three shades (Urban Outfitters, $18). Perk up your mornings any season with a colorful coffeepot that makes for an eye-catching addition to your countertop or table. We love the sleek design and bold shade of orange (MoMA Store, $88). 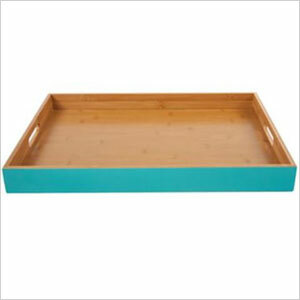 Use this bamboo tray painted with a pop of color to serve guests or simply as an accent in your kitchen — or both. We’re partial to the turquoise, but you can also opt for red, white, black, lime or yellow (JCPenney, $75). Trade your plain old olive oil bottle for a pretty stoneware dispenser that deserves to be seen and not hidden in a cupboard. 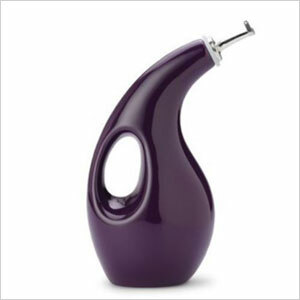 Choose from several shades, including eggplant, orange and red (Food Network Store, $14). 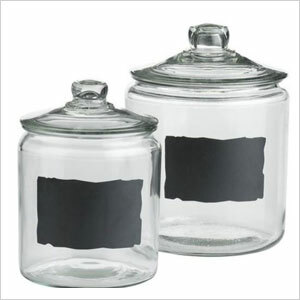 Keep track of what you have and when you purchased or made it with the help of chalkboard jars that allow you to write on the chalkboard labels. Since they’re practical, they can easily work for any season (Pier 1, $10-$14). 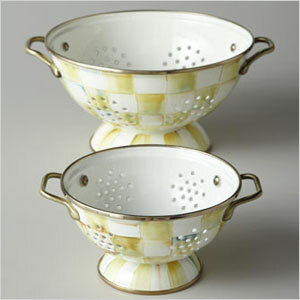 You’ll want to show off these elegant colanders rather than only pull them out when you need to drain pasta. The soft tones work equally well for winter and as you transition into warmer weather (Horchow, $48-$78). Anything playful is perfect for winter, when the days get short and you just wish spring would hurry up and get here. 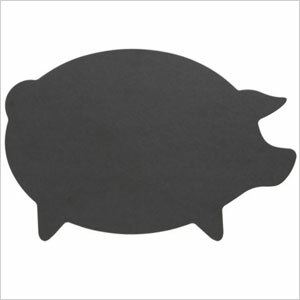 That’s why we love this pig-shaped cutting board, which would look great on any countertop come spring (Crate & Barrel, $35). Coasters should never be an afterthought. They can add elegance or color to any table, and we were immediately smitten with these snake-print coasters for that in-between time when winter turns to spring (C Wonder, $48). 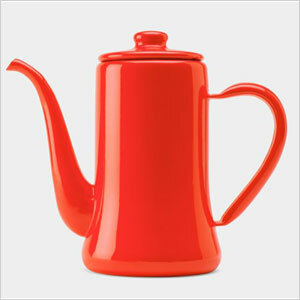 Rather than opting for a simple white or black kettle, go for something a little more eye-catching. 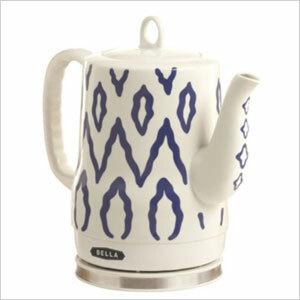 We like this blue and white print kettle for an all-season boost to your kitchen (Target, $50). 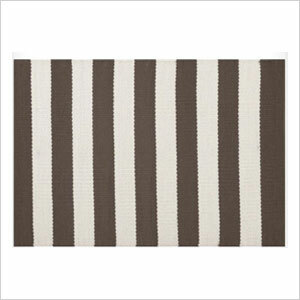 Set your kitchen table with these simple but chic striped place mats that integrate well into most decor schemes and enhance either a winter or spring table (Dwell Studio, $55 for four). 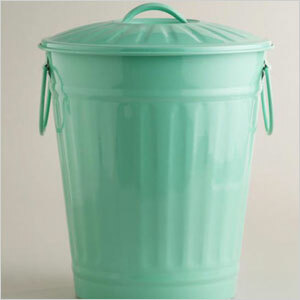 This is one trash can you won’t want to hide under the sink. We love the bright, spring-ready color and the retro design, but it’s also a year-round accent that will easily add some life to your kitchen (World Market, $20). 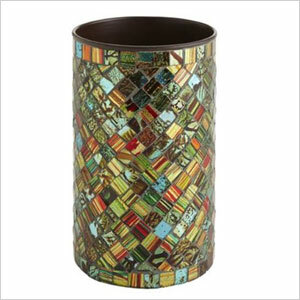 The colors in this mosaic utensil holder can bring to mind both winter and spring — the darker tones are more indicative of colder temperatures, while the shiny brightness of the accent seems to scream “spring” (Pier 1, $20). 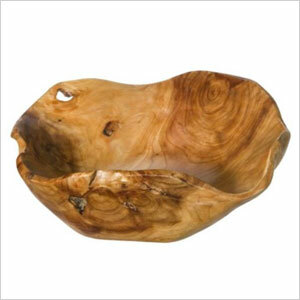 In winter, display pomegranates, ornaments or other seasonal decorations in this free-form natural wooden bowl, but it the spring switch to items that call to mind warmer weather (Target, $30). No extra kitchen storage? 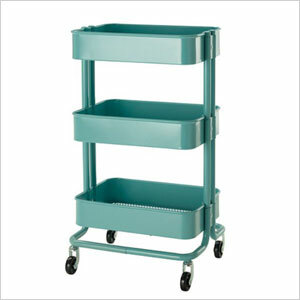 That’s not a problem with this colorful sea green kitchen cart that’s bright and colorful for spring and cheerful enough for dark winter days (Ikea, $50). If you’re looking for a year-round table runner for both casual use and entertaining, we suggest this one made with natural fibers. 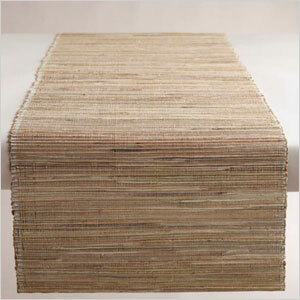 It’s durable, it goes with anything, and it looks great on most tables (World Market, $25). 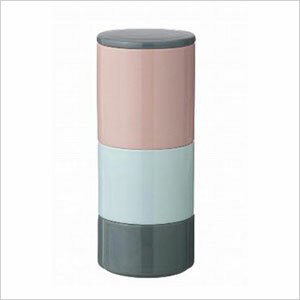 We love kitchen accents that are useful as well as stylish, and these stackable jars with a lid in muted pastel tones fit the bill. The lid fits all three jars, so you can use them separately or stack them (2Modern, $90). 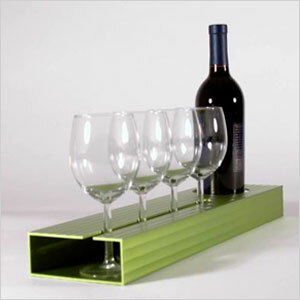 Impress guests with this vibrant lime green wine tray ideal for any-season entertaining. The sleek tray holds four wine glasses and a bottle of wine (2Modern, $98).